Most common abnormality detected on shoulder MRI examination is a tear in the rotator cuff tendon. There may or may not be any history of recent trauma. Most commonly the tear is in the supraspinatous part of the tendon. The symptoms in these patients may be persistent pain, inability to put the shirt on, difficulty in abduction, shoulder pain while sleeping and disturbed sleep. 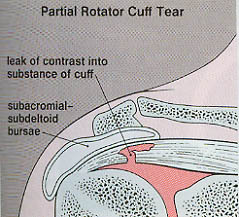 Sometimes the tear may be more anterior in the subscapularis part of the tendon. These patients have difficulty in internal rotation of the shoulder. Other abnormalities detected on MRI are injuries to the glenoid labrum or the joint capsule, degenerative arthritis in the acromioclavicular joint or degenerative spur from the acromion process, causing impingement of the rotator cuff tendon .